AppsFlyer’s rich in-app events provide advertisers with the ability to track any post-install event and attribute it to the originating media sources. If your users perform registrations, complete tutorials, add items to the shopping cart or make purchases, the in-app events data can show it, with details. Rich in-app events are essential in determining the value of your users, and the quality of the traffic you get from different media sources. Therefore, although they are optional to implement, AppsFlyer HIGHLY recommends doing so. Another important aspect of using in-app events, is the ability to map AppsFlyer's in-app events with advanced ad networks. This enables the networks to efficiently optimize on their traffic and sometimes also build highly targeted audiences. An in-app event is comprised of an event name and event parameters. You can use any event name string of your choice. However, AppsFlyer's SDK supplies the recommended event names via enumerations and definitions (see the Event Types tab for the list of recommended events and parameter names). Event names are case sensitive, e.g., by sending both af_purchase and af_PURCHASE as event names, two separate events are created. Any string to define the event name. A map of event parameters that comprise a rich event. A dictionary of event parameters that comprise a rich event. 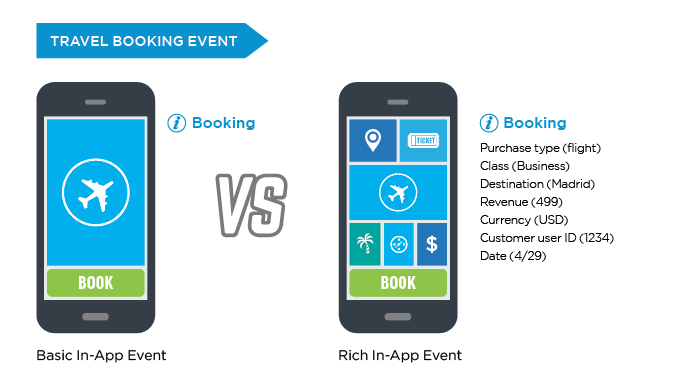 If your app is a hybrid app, see our guide on in-app events for hybrid apps. Different networks have their own limitations regarding the permitted characters in the event names. To avoid any possible problems AppsFlyer recommends using only lower-case alpha-numeric characters (a-z and 0-9) for your in-app event names. The following section describes the recommended structure of each event type together with the parameter mappings to Facebook, Twitter, Criteo, Google Ads and Snapchat. The following parameters, as part of the rich in-app events value, are only available in the raw data reports. Make sure your account has access to raw data reports to fully enjoy rich in-app events benefits. *To report an event containing multiple items, click here. Description: Used to track add to wishlist events of specific items. * af_revenue is counted as revenue in AppsFlyer’s platform. **af_price - You can use af_price as a monetary parameter that is not counted as revenue (such as in an “Add to Cart” event). This parameter refers to the individual item price. The total amount of all purchases appears under the af_revenue parameter. For a list of currency symbols supported by AppsFlyer, click here. Description: Used to track app/item rating events. You can add multiple items to a single transaction. Instead of single values per event parameter you can have multiple items describing the transaction, separated by commas. In the same transaction, Mr A. Flyer purchases two identical shirts, one pair of shoes and a hat from a US-based online store. The sequence in which each item is listed must be identical for each parameter. Complex In-App events enable sending multiple events in a single API call. They are useful when you want to see several closely related user actions grouped together, e.g. adding several products to the basket in a single session. Complex In-App events cause postback issues with Facebook and Criteo. If you need the event to be fully mapped with Facebook and Criteo, you should send separate events per user action, e.g. send an Add to cart event per each added item. Using the in-app events raw data you can group these events together. SDK sends the events to AppsFlyer's servers and waits for a response. If the SDK doesn’t receive a 200 response, the event is stored in the cache. Once the next 200 response is received, the stored event is re-sent to the server. If there are multiple events in the cache, they are sent to the server one promptly after another. SDK’s cache can store up to 40 events, which means that only the first 40 events that happen offline are saved. Everything that comes afterwards until the next 200 response, gets discarded. AppsFlyer has an in-app event deduplication mechanism. It checks all in-app events to see if there was an identical in-app event that came from the same appsflyer_id less than 10 seconds beforehand. If such an event is found, the mechanism removes the duplicate. Deduplication works only for in-app events which are sent from the SDK. S2S in-app events don’t get deduplicated. In this section, we list comprehensive sets of in-app events for several verticals. Each vertical in this section contains carefully selected in-app events that we recommend tracking. Select the in-app events that you want to track. We recommend tracking all the events listed in your vertical. Copy the code snippets for each in-app event and implement in your app where applicable. 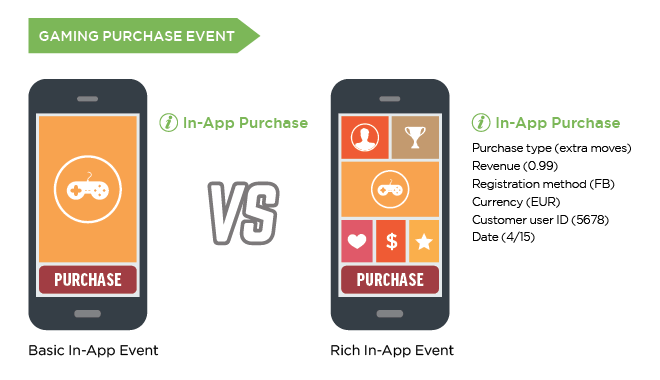 Tracking in-app purchases can help you understand what offers users purchase the most. Tracking leveling up helps you understand how engaged your users are. Tracking share and invite events helps you understand how many users share and invite other players, and on what social media platforms they do so. This event can help you track the retention of your registered users. Trigger this event whenever the user logs in. This event can be sent without any additional attributes. Learn how many users installed the app but never signed up. Learn what signup methods your users prefer. The best way to track this event is to trigger it when the user completes the signup process. Determine the LTV of your users and the ROI of your campaigns across ad networks and ad agencies. Determine what offers are most popular with your users. Cross-reference campaigns with purchased items in order to optimize campaign targeting. To track this event properly, you should trigger it when the user lands in the thank you page after a successful purchase. Determine which campaigns generate the most active users. See what type of users are most active and engaged. Associate overall user activity with dimensions such as revenue etc. To track this event properly, you should trigger it when the user lands on the level completion page. Learn what topics users might have trouble with. Learn what tutorials are not performing well and improve them. When a user completes the tutorial. An event will be sent with an attribute indicating successful tutorial completion. When a user starts the tutorial but quits without completing it. When the user quits, an event is sent with an attribute indicating that the user didn't complete the tutorial. 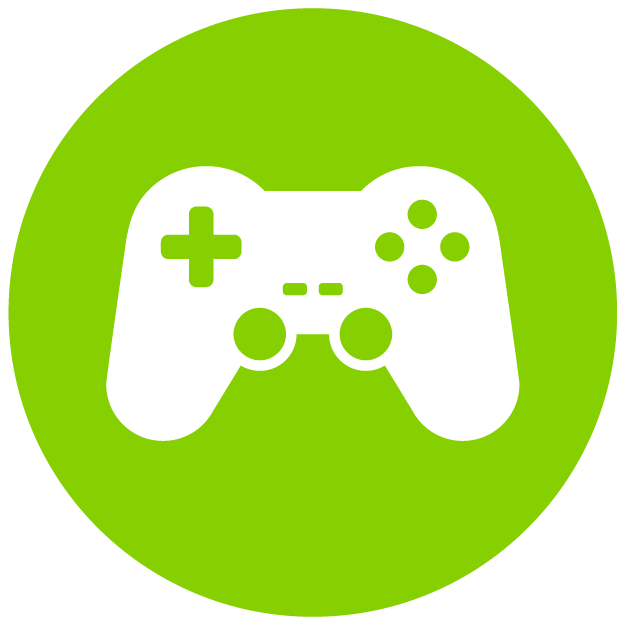 Users like to share their achievements in games on social media sites. Sharing creates brand awareness and can drive more users to download and install your app. By tracking the Share event you can understand when users are most likely to share the app with their friends. The AppsFlyer SDK has dedicated methods for tracking shares and invites. af_description string New High Score / Level up / Game won The reason for sharing on social media. Could be a new high score, leveling up, etc. Learn on what social media sites users usually send invites to friends. Learn how many users invited their friends to download and install the app. To track this event properly, you should trigger it when the user successfully invited a friend to download and install the app. See how many users claimed bonuses that are offered to them. Associate claimed bonuses with user activity and engagement. To track this event properly, you should trigger it when the user claims a bonus and it gets updated in their account. eCommerce apps allow buyers to easily search for and buy goods online. One of the core features of eCommerce apps is that they allow buyers to compare prices in order to get the best deals. We recommend that you implement event tracking in your eCommerce app. Tracking events can help you gain valuable insights into what people look for and what they buy. Highlight the most popular categories. See what buyers are searching for. Track how many buyers completed checkout. Learn how many buyers are recurring buyers and how many are just one-time buyers. The purpose of the Complete Registration event is to let you track how many users signed up after downloading and installing the app. You can also track the signup method i.e. Facebook, email etc. Trigger this event after a user successfully registered. How many users are active. When users are most active. Trigger this event when the user successfully logs in. This event can be sent with no additional attributes. By tracking Search events you can learn what users are looking for. You can also learn what search results are most relevant for them. Additionally, you can track what search results lead to purchase. When the user clicks on the search button. When the user lands on the search results page. Correlate product views with product sales. Understand what categories are the most popular according to product views. See the correlation between buyers currency and the products that they view. You should trigger this event when the user views a specific product details page. It is common for eCommerce platforms to have lists that show products by category such as newly added products, related products, recommended products etc. The List View event can help you track what lists buyers view the most. Trigger this event when the buyer views a specific list. By tracking the Add to Wishlist event, you can track what products and categories buyers add to their wishlists. When you know what products are often added to wishlists, you can then offer these products in sales or discounts and encourage buyers to purchase them. You can also retarget these users according to the products that they added to their wishlist. Trigger this event when buyers add items to their wishlist. See how many products on average buyers add in one purchase. See how much time passes between adding two different products. 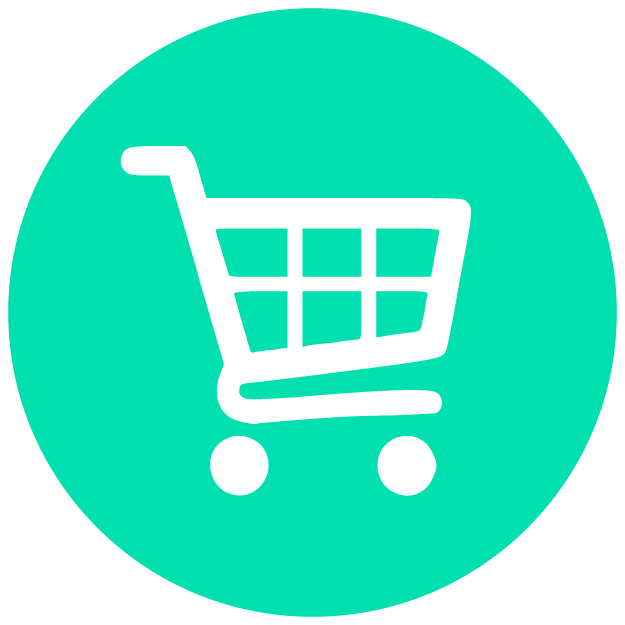 See who many buyers abandon their cart. Trigger this event when the buyer adds a product to the cart. See the average price when buyers checkout and compare it with the average price in the purchase event. See if users add or remove products after proceeding to checkout. Trigger this event when the buyer initiates the checkout, but didn't complete the check out yet. If there are several products from different categories, use arrays to send the data. See how many users overall are actually buyers. Track the most active buyers and retarget them deals according to their purchase history. Understand what products and categories perform well in term of overall purchases. Track revenue generated from purchases across products and categories. Track revenue generated across campaigns and media sources. Trigger this event when a buyer finishes their purchase but didn't necessarily pay yet. af_order_id string X123ABC ID of the order that is generated after purchased. Tracking the Completed Purchase event can help you analyze how purchases are actually paid in full. When a user pays for their purchase, the event can be sent using S2S since this event happens in the back-end. This event should be sent if payment is done offline i.e. bank transfer or cash on delivery. If you send this event, make sure that the Purchase event ( af_purchase) doesn't contain the af_revenue parameter. If you send both events with the af_revenue parameter, the revenue is doubled. See what items buyers remove from their cart. See the product categories of items that buyers remove from their cart. Compare the data from the Add to Cart event to gain insights into products that don't make it to checkout. Trigger this event when a buyer removes an item from the cart. See how long it takes a new buyer to purchase. See what products first-time buyers prefer to purchase. See the average price and revenue of first-time purchases. Trigger this event when the user completes their first purchase. 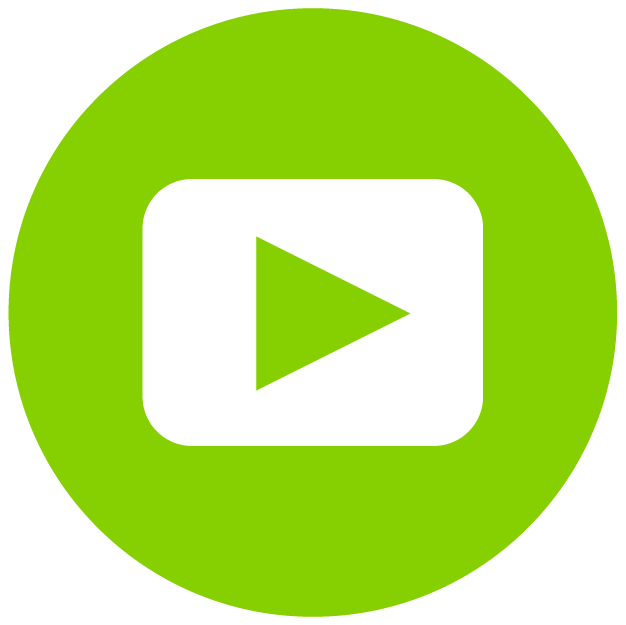 With the growing requirement by users for on-demand content, the streaming applications market has become very competitive. If you manage and run an on-demand content streaming app, it is recommended that you track events in the app. See what content users consume. Analyze and optimize campaigns according to content demand. Measure user engagement and usage. The purpose of the Complete Registration event is to let you track how many users signed up after downloading and installing the app. You can also track the signup method i.e. Facebook, email etc. to learn what signup method users prefer. See how many users opt-in for a trial period. If the trial is part of a promotion or a collaboration with a partner, you can track what promotion prompted the user to activate the trial period. Trigger this event when the user opts-in and activates the trial period. See which campaigns bring users that subscribe. Compare the number of users in trial against subscribed users. Track revenue generated from subscriptions and attribute it to campaigns and media sources. when the user successfully subscribes. When a subscription is renewed. Refer to our Subscription Tracking Guide for more information. Track media consumption by type and content. See the languages of the most popular streamed content. See minimum, maximum and average duration of the streamed content. Trigger this event after a predefined number (i.e 2 minutes) of streamed content. See which users make extensive use of your service and which are not. Understand what media types and content types are popular. When the user finishes streaming a media item. When the user quits streaming a media item. Tracking downloaded media can help you highlight user preference. You can track media play and media download and compare the two. You can see what media users prefer to stream and what media they prefer to download. Trigger this event when a user starts downloading media. Tracking saved media can help you highlight user preference. Trigger this event whenever media is saved onto the user's device. 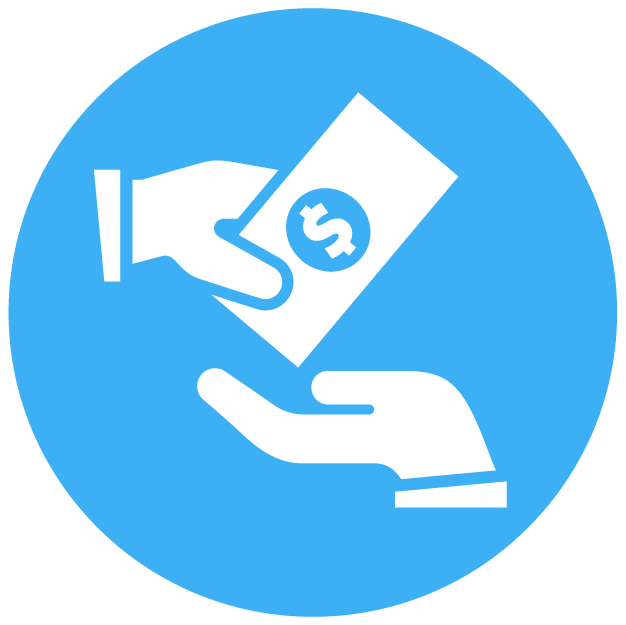 P2P (peer-to-peer) lending is a new way for individuals and businesses to lend and borrow money from one another. You can track the activity of individual lenders and borrowers. You can learn what type of loans people offer as opposed to what loans borrowers are interested in. You can gather metrics about the average, minimum and maximum sum of loans. You can track loan acceptance and rejection rates. With such data gathered from event tracking, you can highlight trustworthy borrowers and offer them better interest rates. Similarly, you can see who the most active lenders are and offer them lower fees. In addition, once you know what type of loans are most popular with your users, you can launch marketing campaigns that target such audiences. Track how many users register but never verify their account. See the correlation between registration method (email, Facebook, Google) and verification rates. Trigger this event after the user submits a request to register to your P2P service. Tracking the Complete Registration event can help you see how many users actually verify their identity after registering. You can attribute these users to campaigns and see what campaigns generate active users. Trigger this event when the user's registration is approved. Borrowers need to fill in several forms in order to request a loan. You can track the forms that are filled by a potential borrower in order to see the drop rate. Apart from the drop rate, you can also retarget borrowers who quit one form away from completing their loan application. When you send the event, include the form name in the event name. Trigger this event whenever a borrower submits a form. You can send this event without additional attributes. It is highly recommended that you associate loans with lenders. To do so, make sure to set the customer user id. Setting the customer user id is your way to match lenders with users of your app as they appear in AppsFlyer. By setting the customer user id you make sure that any event is sent with the customer user id. Track the overall number of loan applications in your app. Learn about the maximum, minimum and average amount in loan applications. See the type of loans people apply for. Trigger this event when the user successfully submits a loan application. You can see what type of loans are accepted. You can see the amount requested in loans that are accepted. You can see what lenders accept the most loans, what types and what amounts. Trigger this event when a loan is accepted. Tracking the Loan Rejected event can help you understand the reasons why loans get rejected. You can see the correlation between the amount and loan period and rejection rates. You can also retarget users whose loan gets rejected and suggest them to take a smaller loan. Trigger this event when a lender rejects a loan. Tracking the Payment event can help you mark borrowers as trustworthy. Trustworthy borrowers are those that follow their obligation to cover their loans. You can attribute borrowers to campaigns and understand which campaigns generated trustworthy borrowers. Tracking this event can also help you gather data about the minimum, maximum and average amount of payments. Trigger this event whenever a user makes a payment for their loan. Tracking the Payment Completed event can help you highlight borrowers who follow their obligation to cover a loan. You can also re-target such borrowers and offer them lower interest fee or other promotions. Trigger this event when a loan is fully paid back. How passengers and drivers interact. Countries where more people use your ride-hailing service. Metrics about price, rides and ride distance. Learn what sign up method your users prefer (Google, Facebook, Email). Understand how many users actually sign up after downloading and installing the app. See registration trends across countries to determine the countries whose users are most likely to use your app. Trigger this event when the user successfully signs up. Learn how long it takes a user to add their payment info. What payment methods are most popular (credit card, e-Wallets). Setup campaigns and collaboration with popular payment method providers. Trigger this event when the user successfully adds payment info in their account. Learn about trends, where people ride to and from where. See the average distance of a ride. See what cities, regions, and countries most users come from. In addition, tracking this event alongside the other three booking related events can help you track successful transactions. You can track successful transactions and compare them with unsuccessful transactions. For example, you can see how many ride bookings are requested and how many ride bookings are completed or canceled. Trigger this event when the passenger created a ride booking request. Learn who the most active drivers are. See what destinations are common among drivers. See the average and overall ride prices for each driver. In addition, tracking this event alongside the other three booking related events can help you better understand driver activity. You can see which drivers confirm the most ride booking requests, which drivers choose short rides as opposed to long rides etc. Trigger this event when the booking is accepted by a driver. Track drivers or passengers that constantly cancel. Learn how many rides are canceled. Correlate cancellation rate with attributes such as price, destination, distance, cities etc. Learn the reasons why a ride is canceled. Trigger this event when the booking is canceled. Learn about passenger spending and driver earnings. 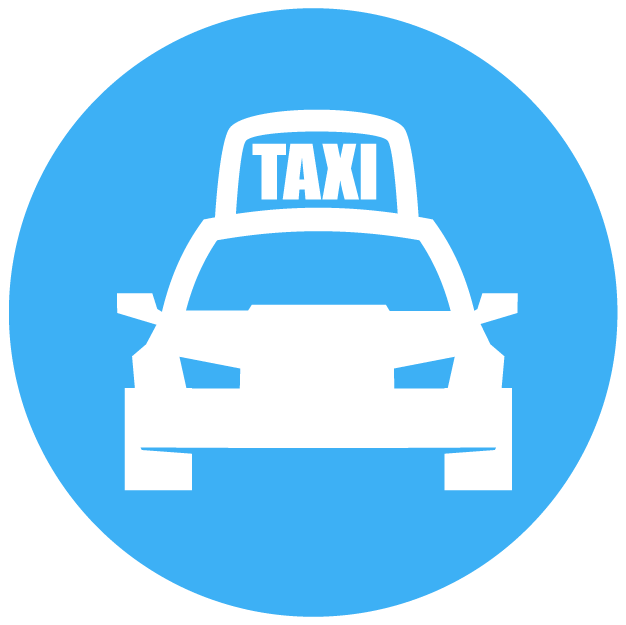 Correlate completed rides with attributes such as destination, distance, payment type, driver ID etc. See the average and overall distance for drivers and passengers. Compare completed rides with canceled ones. Log and track the score of drivers. Trigger this event when the journey is complete. See how many passenger trade credits for vouchers. See what sort of vouchers and discounts passengers prefer. Trigger this event when a passenger spends credits. 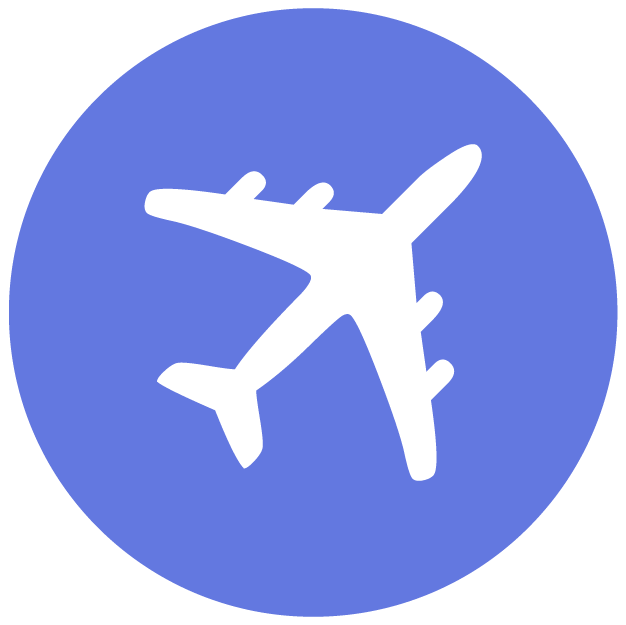 Learn about popular airlines that users prefer to travel with. Send this event when the user lands in the thank you page after successfully booking a flight. purchase_method string credit card Credit card, PayPal, etc. Understand what flight offers users find most appealing. Understand if search results are relevant to search queries. It is best to trigger this event when a user clicks a search result. Learn what users are mostly looking for. Understand which destinations are most popular. See how many users travel with kids. See what time of the year users prefer or plan to travel. Trigger this event when the user clicks on the search button, after filling in the search form. This event can help you track successful and unsuccessful attempts at adding payment info when booking a flight. Trigger this event when a user clicks on the book a flight button. By tracking in-app events in your hotel booking app, you can see what campaigns and media sources bring users that actually book vacations. In addition, you can see which campaigns and media source bring the users that book the most and generate more revenue. You can attribute preferences such as hotel score, season, country and number of kids to users that come from certain media sources. In attributing user preferences to media sources, you are able to optimize campaigns in media sources by targeting user preferences. See what media sources bring users that actually signup. Trigger this event whenever the user logs in or opens the app. The purpose of this event is to let you know what users are searching for. When you know what users are searching for, you can offer them better deals and promotions. In addition, you can see what users of certain geographical locations are searching for and target them accordingly across media sources. Trigger this event when the user performs a search. The purpose of this event is to show you what hotels users are viewing. You can see what property type users are looking for and what their preferences are in terms of season and location. You can then retarget these users in ads and promotions. Moreover, you can see which users view and then book as opposed to users who just view. For those who actually book, you can see which media sources bring them. For those who just view, you can retarget them. Trigger this event when the user is viewing a property. The Add to Wish List event indicates hotels and destinations that users wish to book. By tracking this event you can gain insight into what users want. If you know that some users are looking for specific hotels, in specific regions and of specific scores and ratings, you can target and retarget these users. Trigger this event when a user adds a listing to their wish list. The purpose of this event is to allow you to track how many users initiate checkout. Additionally, you can see what purchase method they use to checkout (credit card, e-wallet) and target accordingly. You can also see what users don't finish the checkout process and retarget them. Trigger this event when the user adds their credit card information or connects their e-wallet. 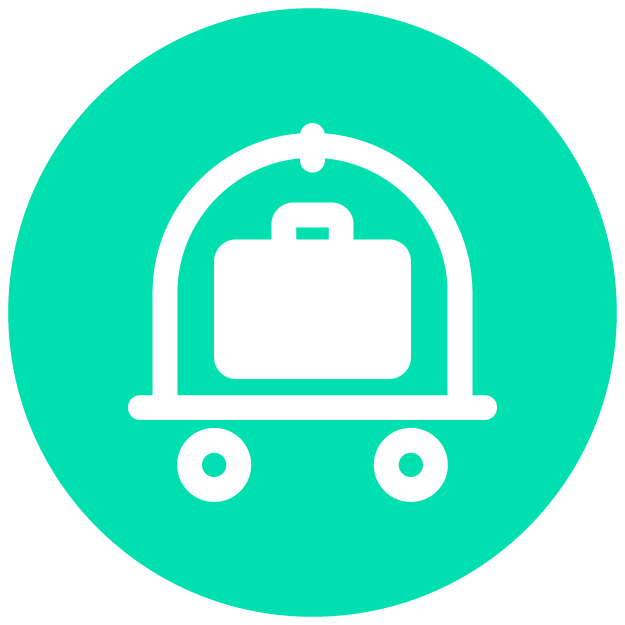 Track revenue generated from booking. See how many users book hotels with kids. See what hotels are popular among users. Trigger this event when the user reaches the thank you page after booking a hotel.